If you're missing one or more teeth, you may be all too aware of their importance to your looks and overall health. 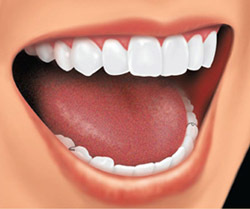 Your teeth are designed to work together to help you chew, speak, and smile. When teeth are missing, it is difficult to do these things. Even the loss of a back tooth may cause your mouth to shift and your face to look older. Fortunately, missing teeth can be replaced. • A missing molar (back tooth) can make it harder to chew. 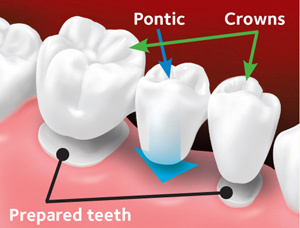 • When a tooth is lost and not replaced, the remaining teeth can shift. 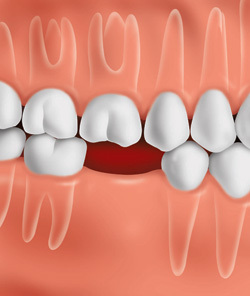 • Bone loss can occur around the missing tooth. This may cause the remaining teeth to become loose over time. 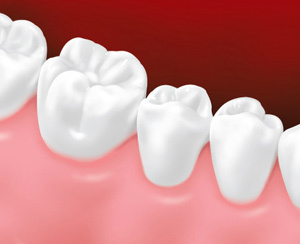 If the tooth is not replaced, other teeth can drift out of position and change the bite. Shifting teeth can possibly lead to tooth decay and gum disease. Many patients choose implants to replace a single tooth, several teeth, or to support a full set of dentures. Implants are posts (metal "roots") that are surgically placed in the upper or lower jaw, where they function as a sturdy anchor for replacement teeth. They are made of titanium (a strong, lightweight metal) and other materials that are accepted by the human body. Most patients find that an implant is a good replacement for their missing tooth because it is secure and stable. A tooth implant is a surgical procedure, so it's not an option for everyone. People with chronic illness may not be good candidates for implants because it can take them longer to heal after surgery.. Using tobacco and other products such as electronic cigarettes can also slow healing. Your dentist can help you decide if implant treatment is a good option for you. There are different kinds of implants and treatment approaches The length of treatment depends on many things, including type and location of the implant, your bone structure and overall health. Your dentist will outline the treatment plan with the best chance of success for you. 1. Placement of the implant: The dentist surgically places the implant into the jawbone. There may be some swelling and/or tenderness after the surgery, so pain medication is usually prescribed to ease the discomfort. The dentist may recommend a diet of soft foods during the healing process. 2. The healing process: What makes an implant so strong is that the bone actually grows around it and holds it in place. This is a process that takes time. Some patients might need to wait up to several months until the implant is completely healed before replacement teeth can be attached to the implant. Other patients can have the implants and temporary teeth placed all in one visit. 3. Replacing your missing tooth or teeth: The dentist or a lab will custom-make a crown, bridge or dentures to fit your mouth and your implants. Once completed, the man-made teeth are attached to the implant posts. It can take some time to make the crown, bridge or denture that will attach to the implant. Your dentist may give you something temporary to fill the space. This can help you eat and speak normally until the permanent replacement is ready. Good oral hygiene is very important to the success of the implant. You'll need to make sure the area around the implant is especially clean. Your dentist may recommend that you use a special toothbrush, called an interproximal brush, or a mouthrinse to help prevent gum problems. 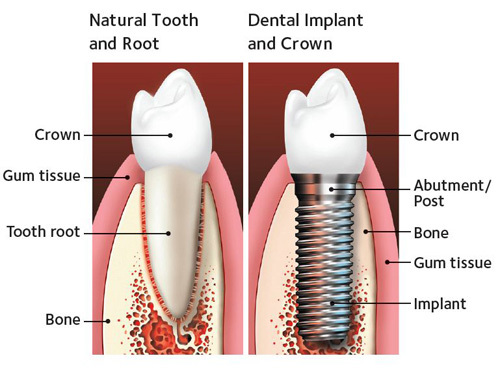 • An implant is most similar to a natural tooth and often feels more comfortable. • Nearby teeth remain intact and do not have to be involved in the placement procedure. • Implants are a good value because they can last a lifetime with good care. • Implants may help prevent shrinkage of the jawbone from tooth loss. • May fit better and be more comfortable than removable partial dentures. • Implants require surgery, so they are not right for everyone. • Implant placement may take longer and may require more dental visits than other options. • Implants may cost more than other treatments. Another tooth replacement option is a fixed bridge. This is a restoration that fills the space where one or more teeth have been lost. 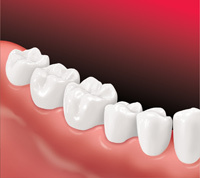 A fixed bridge is bonded or cemented into place - only a dentist can remove it. Placing a bridge usually takes more than one dental visit. On your first visit, your dentist prepares the teeth on either side of the gap. The bridge will later be attached to these teeth. Your dentist then takes an impression of your teeth and the space to send to a dental laboratory. Technicians at the lab make the bridge out of metal, ceramics, glass-ceramics or a combination of these materials. 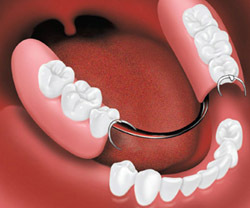 Your dentist will place a temporary bridge to protect your prepared teeth while you are waiting for the permanent one. 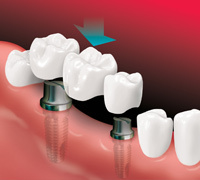 During one or more follow-up visits, the permanent bridge is fitted, adjusted and cemented in place. 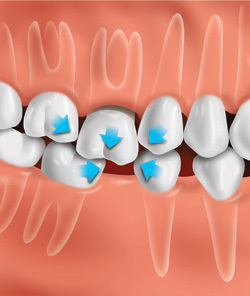 Before the bridge, teeth are shown with the space where a tooth has been lost. Teeth next to the gap are prepared for placement of the bridge. 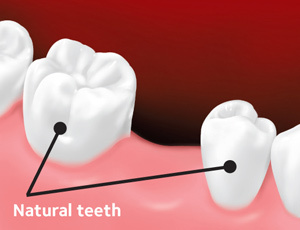 • A fixed bridge can look, feel and function like natural teeth. • Fixed bridges don't require removal for cleaning. • It may cost less than implants. • Fixed bridges are likely to be more expensive than a removable partial denture. • They affect the teeth next to the missing tooth – once they are prepared for placement of the bridge, they will permanently lose their natural look and shape. • Fixed bridges may require extra effort to clean under the replacement tooth. A removable partial denture can easily be taken out of the mouth for cleaning. Partial dentures usually have replacement teeth fixed to an acrylic base that matches the color of your gums. The acrylic base may cover a framework made of several durable materials. Partial dentures often have some form of clasp that attaches to your natural teeth. Your dentist may also recommend crowns, or "caps," on your natural teeth. Crowns may improve the way a removable partial denture fits your mouth. It takes practice to put in and take out a removable partial denture. It may feel odd or tight for the first few weeks. But in time, you should get used to it. Never force it into place by biting down. This can bend or break the clasps. If you have a problem with your new partial denture, talk with your dentist. You should not wear your removable partial denture 24 hours a day. Your dentist may tell you to take out the partial denture at bedtime and put it back in when you wake up. You should keep your partial denture in water or denture soaking solution when you are not wearing it. Do not let it dry out because it can lose its shape. But remember that if your partial denture is out of your mouth for extended periods of time, your teeth can shift or move and then the partial denture will no longer. Your dentist will usually make follow-up appointments to look for pressure points or sore spots. He or she will adjust your denture so it fits comfortably. Do not try to adjust your partial denture yourself. Over time, as you age and your mouth changes, your removable partial denture may no longer fit well. It also could break, crack or chip, or one of the teeth could loosen. Sometimes dentists can make the repairs, often on the same day. Complex repairs may take longer. Once your missing teeth are replaced, eating should be a much more pleasant experience. Since missing teeth can make it difficult to speak clearly, wearing a removable partial denture can help with that, too. Talk to your dentist. You can get answers to your questions and together you can decide which option will work best for you: implants, a fixed bridge, or removable partial denture. 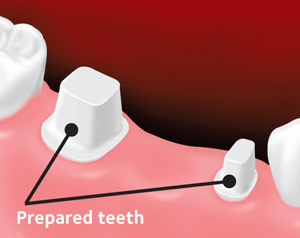 Attachment tooth/teeth: The prepared teeth on either side of the gap which holds the fixed bridge in place. 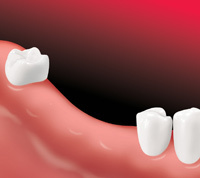 Bridge: A tooth replacement option that fills the space where one or more teeth are missing by permanently connecting a replacement tooth or teeth into place. Crown: A "cap" that is either placed over attachment teeth as part of a fixed bridge or placed over an implant itself to serve as a new tooth replacement. Partial Denture: A tooth replacement option in which the replacement teeth are fixed to an acrylic base that matches the color of your gums. It has clasps that attach to your natural teeth to hold the denture in place and is removed daily to be cleaned. Implant: A tooth replacement option in which a metal post is surgically placed in the upper or lower jaw bone and acts as a support for a replacement tooth or teeth.